Co-authored with Stefanie Lightman. Stefanie is co-founder of iFridge & Company and consults on strategic positioning. Bill and Stefanie both have years of experience driving and riding in the bus. Effective teams get things done. The science and skill of running effective teams is hugely important in business. Effective team leaders run effective teams. The team leader gets everyone involved, leverages their talents, maintains focus on the goal, manages the schedule and assignments, and is the person you should thank the most if you receive a bonus when the goal is reached. We think such an important role deserves a stylish and metaphoric name. “Team Leader”? “Project Manager”? Too lame! Commonly, we hear sports metaphors like “quarterback” or “point guard” to describe the team leader role. In Canada, you hear “stick-handler”. And it is certainly hard to imagine a football team scoring touchdowns without a quarterback, or a basketball team executing plays without a “point guard”, or a hockey team scoring goals without a stick-handler. We both like the term “bus driver” the best. There is a sense of urgency about a bus going down the highway without a driver! A bus driver is a highly responsible position. A bus and its passengers can perish instantly. Bus drivers can be male or female; tall or short; creative or analytical. The only physical characteristics required are the ability to see and quick reaction time. There is also the sense of journey with a bus, just like the mission of a team. Everyone is traveling together and hopefully focused on that common mission. Everyone is heading in the same direction. Everyone relies on the bus driver to get them safely to the destination – on time and within budget. The bus driver must continuously monitor the direction, watch for detours, and make either minor or major course corrections. Often guided by a well articulated company vision and strategy, the bus driver now must choose the route. The bus driver should empower passengers to make the journey as effective as possible. The bus driver is usually the first to see upcoming roadblocks that can impact success, but roadblocks might also be seen first by passengers, if they’re paying attention. Would your bus driver call an impromptu meeting when the “Check Engine” warning light comes on, or just ignore it? Running an effective team or driving a bus – all the analogies work. Another downside of the sports metaphors is that some people believe it is perfectly acceptable to have two quarterbacks, two point-guards, or two stick-handlers on a team. While sometimes that is the case in sports, and good succession planning requires a backup, a bus can uniquely have one driver. Riders in the bus can advise, point, shout, jump out the window, and maybe even pull an emergency brake, but cannot drive. Bad things happen when more than one person attempts to drive a bus. 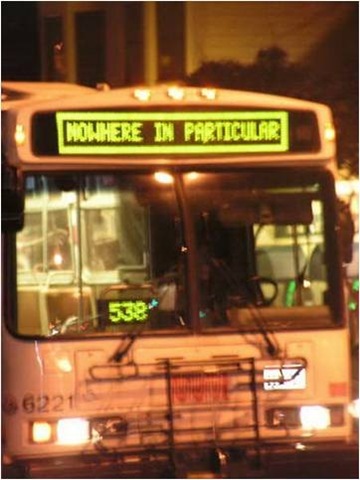 Sometimes however, a bus driver change is required. The most successful way to handle this is to determine that this change should happen early. Recognizing who in your organization can drive the bus and realizing when someone may not be suited for that role, is important to a positive outcome.